Secrets and surprises in Key West! Key West is certainly full of surprises and while we were there we found a couple of really unexpected places including Nancy Forrester's Secret Garden, the wonderful Butterfly Nature Conservatory and a hotel with a garden to die for! Of course, you might argue that Nancy's Garden is not so secret any more because everyone knows about it, but it's an acre of jungle in one of the highest value real estate belts in the United States, and you'd be forgiven for thinking that you're somewhere other than Key West once you get inside. Nancy Forrester (above) has lived here for many years and this little oasis in the heart of the town is well worth going to see. But be warned, it's not easy to find and there are no signs. So head for Simonton Street and when you get to Free School Lane (between Southard and Fleming) walk down the cul de sac and you'll see painted parrots on a picket fence. Once inside you're treated to a real tropical forest experience with Nancy's collection of palms, bromeliads, ferns and orchids, to name but a few of those growing, and then there's the birds ... the weather was so cold last week that Nancy had brought them all inside, so we sat in her kitchen listening to her tales about the garden and her life in Key West; how she'd acquired so many birds and the changes she'd seen over the years. The Butterfly Conservatory is brilliant at any time, but especially so on a rainy day (and we had one when we were there), so we were delighted to take cover in this fantasy world of fluttering wings (as were all the other adults we saw there). There's something magical about this number of butterflies in one place and every time I go to a butterfly garden, I'm transported back to my youth! I've been lucky enough to visit two others this year - the Montreal Botanical Garden and the Niagara Botanical Garden which also has a Butterfly Conservatory. It poured with rain the day we were there too! 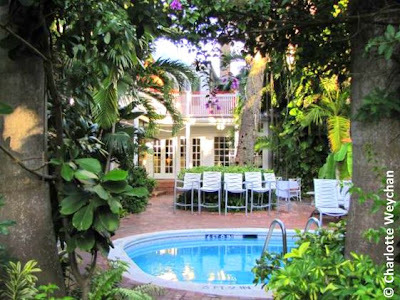 Combine these delights with a stay at The Gardens Hotel (above), just off Duval Street and it makes a perfect garden break in Key West. The hotel was built in 1875 and covers a third of a city block. Peggy Mills bought the property in 1930 and planted many of the palm trees and bamboos that are there today. But this is definitely the place to stay if you're heading for the Keys because you've got the best of both worlds with hotel and garden. There's no noise, yet the hotel is close to all the bars, restaurants and tourist attractions. Great rooms (especially the Carriage House) all with balconies or verandahs; jazz on Sunday afternoons; really helpful hotel staff and a bar overlooking the pool; plus a wine tasting room that could leave you with heady memories of Key West! 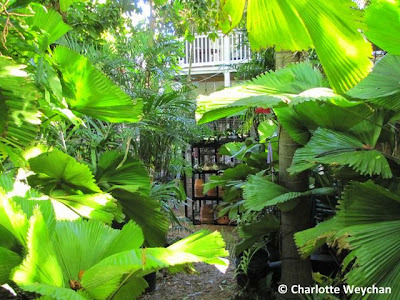 I'm heading back to England tomorrow, but I've got another unusual garden post from my visit to the Keys that I'll be writing while waiting at the airport - the world's first botanical garden that offers you the chance to stay in it! 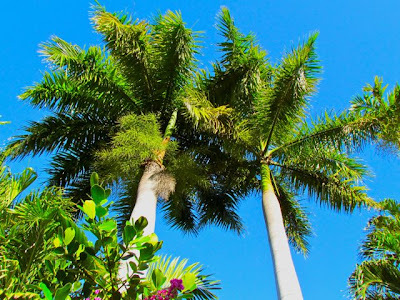 If you missed my other Key West garden posts, you can find them here. 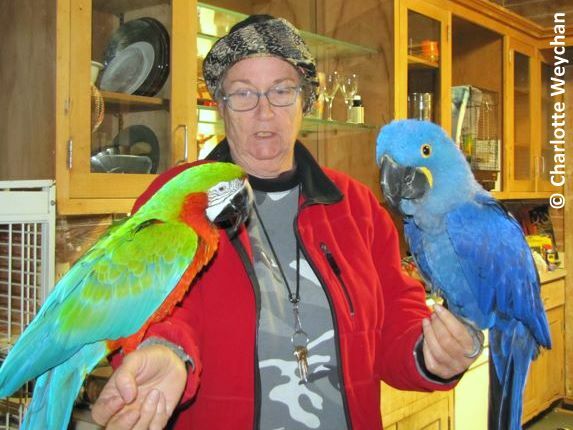 I just love Nancy's beautiful parrots. They must be right at home surrounded by her tropical plantings. When I saw the Conservatory, I immediately thought of the one in Niagara Falls, Canada. But the link did not open for the Key West Conservatory. I will try to access it directly. I too enjoy seeing so many butterflies in one place. I am lucky to live only miles away and one bridge across. Beautiful gardens - they look very inviting from Pennsylvania right about now! I love visiting Butterfly houses. We're fortunate to have a small one at Hershey Gardens here in town. We were fortunate enough to visit a butterfly garden inside the Natural History Museum in D.C. this summer...all of us, from my 75 year old father down to my 14 year old son were mesmerized and delighted by all the fluttering colors surrounding us. It was delightful and I could barely pull myself away from the wonder! 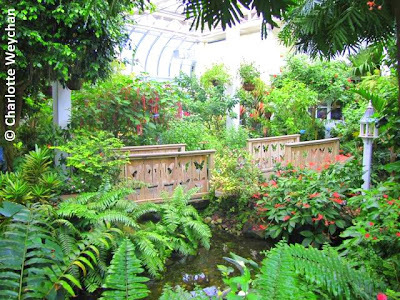 The Butterfly Conservatory is much prettier - I'll have to put that on my life list! Thanks for sharing. Thoroughly enjoyed reading your experience of Key West, I will definitely have to start getting out more.